Juno’s closest approach during the flyby occurred on Monday, March 27, at 1:52 a.m. PDT (4:52 a.m. EDT, 8:52 UTC). All of the spacecraft’s science instruments were operating during the flyby, and now scientists back on Earth will have even more data to go through from the mission so far, as well as, of course, more stunning images. 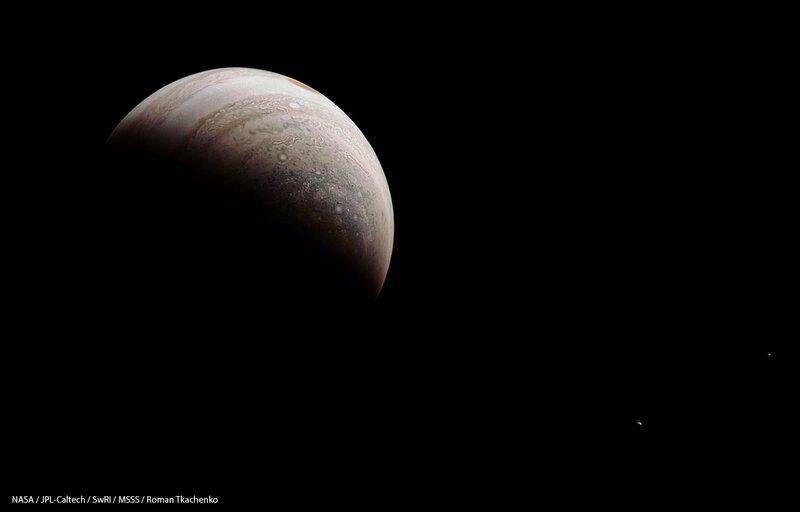 During each close flyby, Juno can see Jupiter’s clouds in incredible detail, revealing intricate and complex formations, especially at the planet’s poles. Indeed they look like works of art. While Jupiter’s mid-latitude and equatorial regions are dominated by broad bands of clouds, the poles features many circular cyclones and other cloud formations. As seen from above the poles, Jupiter almost looks like a completely different planet. At closest approach, Juno is about 4,400 kilometers (2,700 miles) above Jupiter’s cloud tops, traveling at a speed of about 57.8 kilometers per second (129,000 miles per hour) relative to the planet.